Jessie Outhouse of East Alton, Illinois, was found dead on June 13th, 2011 from what is believed to be Madison Count’s 12th heroin overdose this year. Madison County Coroner Stephen Noon confirmed in a phone conversation that although not all the toxicology reports are back yet, substantial evidence points to heroin overdose in the 4 cases whose reports are not yet in. Twelve heroin overdoses before the year is even half over places the county on track for a record number of heroin overdoses. Fatalities from all drug overdoses are currently at 22 cases for 2011. Noon has stated that his department is working closely with the DEA and other law enforcement in an attempt to interdict the flow of drugs. Deputy Chief Coroner Roger Smith has referred to the current rate of drug overdoses as a “public health issue” with this being the worst outbreak he has witnessed in 20 years. The US is not alone in this epidemic, Russia estimates that one in every 50 people of working age is addicted to heroin. South Wales has seen a jump of 180% in heroin addiction rates. In 2008, the EU estimated that a young European died every hour from a drug overdose. So what is the ultimate cause of this burgeoning heroin epidemic across the planet? Outhouse was a navy veteran who served aboard the USS Constellation as an explosives expert in southwest Asia, and was employed at Midwest Explosives Professionals in Fosterberg, Ill. The Alton Telegraph’s online comments indicate a lack of concern about the problem and tend to blame Outhouse for his own death. This ignores known causes and influences on addiction such as environment and genetic predisposition. It is easier to blame the individual than it is to realistically look at causes both proximate and ultimate. The proximate cause of heroin deaths in Madison County is related to the importation of the drug from surrounding regions. But there’s a much bigger picture that must be considered, too. Last year, Russia publicly blamed the US and NATO for refusing to eradicate poppy production by US allied warlords, resulting in an estimated 30,000 heroin deaths in Russia in a single year. 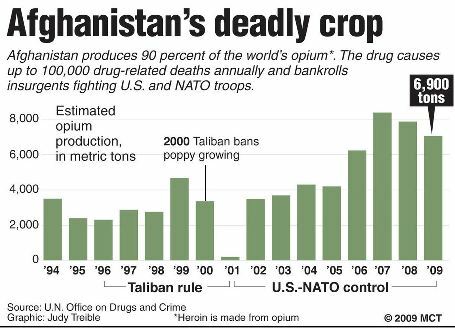 The US Congressional Research Service estimates that Afghanistan currently accounts for 90% of the world’s illicit opium (the essential ingredient of all narcotics) supply. Opium revenues for Afghanistan are equivalent to 7% of the licit GDP for the nation with 10% of the population actively participating. Whatever the US’s official policy, Wikileaks has revealed that Afghanistan’s President, Hamid Karzai, has gone out of his way to protect those accused and convicted of drug dealing. The supply of opium is so plentiful that Afghani drug lords are withholding product from the market in order to prevent further erosion in the prices. Prices have been reported to be at all time lows, and in Afghanistan sacks of opium are sometimes used as sleeping mattresses by Taliban fighters. Meanwhile, US troops overlook opium production in areas controlled by US allies, with much of Afghanistan’s opium production coming from nominal US allies. The ultimate cause of the heroin epidemic destroying much of the world and local youth is the Afghanistan war and the shortsighted policies involved there. Local young people are dying as a result of the Afghanistan war by combat, and because of the flood of heroin caused by the war effort.